Last night Paramore played Usher Hall in Edinburgh and brought out two special guests to do guest vocals on “Misery Business”: a fan named Elenor and Lauren Mayberry from CHVRCHES. Check out the fan video of the performance below! In the video below, you can see Mayberry up on stage rocking out with Hayley—and it's as amazing as it sounds. 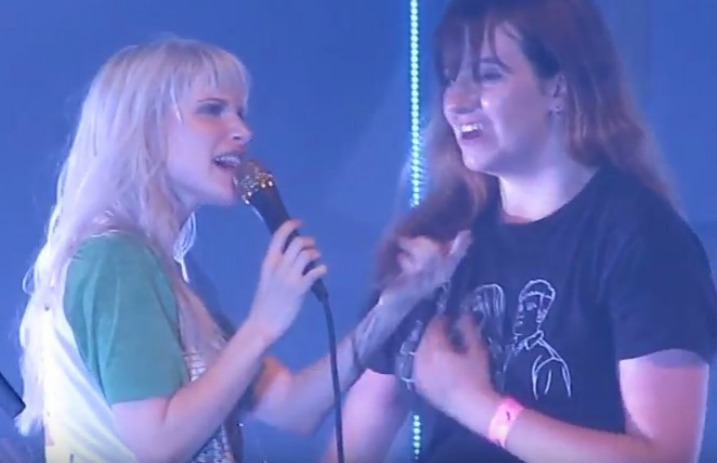 In another fan video you can see more closely as Hayley Williams introduces the ecstatic fan to her co-guest vocalist, Lauren Mayberry! Watch below! This is not the first time Hayley Williams and Lauren Mayberry have worked together. The lovely Hayley Williams lent her voice on a new version of the CHVRCHES song “Bury It,” off their latest album Every Open Eye. Listen to the song and see the Williams + CHVRCHES art here, and see them perform it live together here! The two female mavericks of our scene seem to be pretty close, and we can't get enough of these collabs! How great do you think Lauren Mayberry and Eleanor did? Sound off in the comments below!